17 to 52" 22 to 62" 24 to 72"
Cameras, lenses, or sport optics that are compatible with a 1/4"-20 mount can be connected to the quick release plate, which is secured to the tripod's ball head using a quick release clamp. The ball head is removable, provides up to a 90° tilt for portrait orientation, 360° of independent rotation, and can be locked into place along its range of movement. For added versatility, the center column is reversible, facilitating low-angle photography where an attached camera is positioned among the tripod's legs instead of above them. Additionally, one of the tripod legs can be detached and configured as a monopod with a 22.0 to 75.0" adjustable height for use with the ball head. A nylon carry bag with a zippered closure and shoulder strap is provided for storage and transport. Six, spare anti-twist sleeves are also included for maintenance of the tripod's twist locks. Box Dimensions (LxWxH) 23.2 x 5.9 x 5.1"
AT-72 VentureMaxx 72" Professional Aluminum Travel Tripod with Quick Release Ball Head is rated 4.8 out of 5 by 4. Rated 4 out of 5 by Joe from vidpro at- 72 just received this and seems to be nice for the $. Everthing works smoothly , build quality is decent, case is nice bonus. Shipping was fast as usual with B&H. Only negative is the replacement parts included, several were broken from moving around in the box. There was a small plastic bag in the box empty with the parts scattered. No idea if anything is missing. There is no documentation included just pics on the box. Rated 5 out of 5 by eddie from great product, sturdy and lightweight. perfect combination i order this product and it has no quick release plate but was sent to me without any problems after i notified B&H customer support. the product it self is very sturdy, the ball head and quick release give excellent handling for when im using my phone to record video or my nikon DSLR. for the average user this is a great product due to lightweight, loading capacity, sturdiness and price. can't go wrong. Rated 5 out of 5 by Wayne P. from Very nice tripod! Love this tripod. Easy to set up and very versatile. AND...you can't beat the price! Very sturdy, and holds my camera with ease. Glad I found B&H, and am super happy with my purchase. 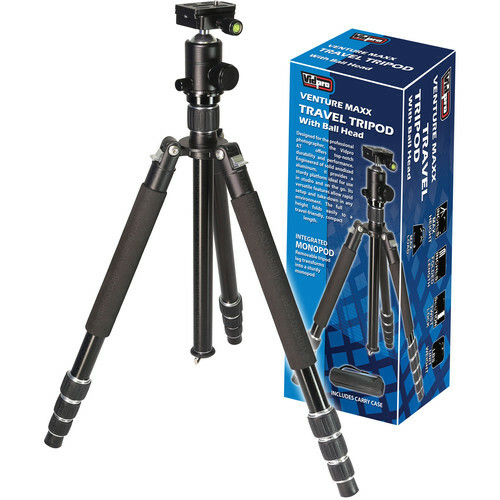 Rated 5 out of 5 by Joe from nice tripod I haven't used it much yet but it seems well built and sturdy for the price. I'm sure there's better out there but is fine for my needs as a non professional. Does this tripod accept a head with an arm attachment for better panning control? does this have tension control? the Specs don't say but the last picture seems to say it does. Yes, there is a tension controlled damping dial which offers fine adjustment of ball movement and precise angle positioning. I already tried to ask this question but it never got answered so Im going to try asking again but in a different way. I understand what a ball head with tension control is. This overview and specs on this page dont say whether or not this tripods ball head has tension control. However, the fifth and last picture on the set of product pictures (the one with all the tiny words) says by the picture of the ball head that the ball head has Tension controlled dampening. So, my question is, is tension controlled damping the same thing as tension control? Or, in other words, does this tripod/head set have tension control? Thanks. In this case, tension controlled damping would be the same as tension control. That being said, this ball head of this tripod would have tension control. Does the QR plate have a D-ring? The camera screw on the plate has a D-ring attached. Can the center column be inverted on the Vidpro AT-72?